This seems incongruous only in the context of late-night television's ancient blood rivalries: On Wednesday night, Seth Meyers will greet James Corden as his lead guest on NBC's "Late Night" show. Yes, Corden will also be on CBS at the exact same hour with his own show (he pre-taped four last week). The juxtaposition may present a challenge for James' fans. But not much: Viewers can easily record one show to watch later -- or catch up the next day on the best parts of the show they missed. That's the blessing (and curse) of late-night now. It may be a little disappointing for viewers who loved the gut-spilling jousting tournaments of late-night's past (and even more so for journalists who wrote about them). But the folks now working those stages in New York and Los Angeles mostly respect each other -- and, at least outwardly, like each other. That certainly seems the case with Meyers and Corden. "We heard he was going to be in New York to host the Tony's," Meyers said of Corden's turn fronting the Tony special Sunday night. "It seemed an obvious choice. He's going to be a fantastic host and it would just be an interesting time to talk to him." 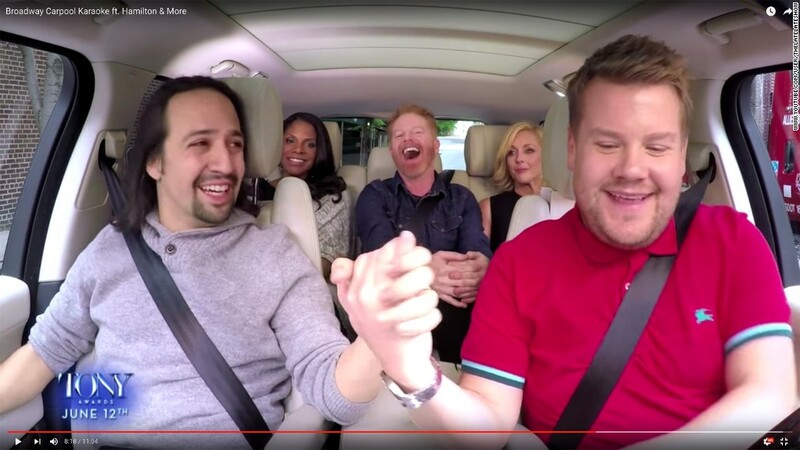 For Corden, crossing networks to appear as a guest could not make more sense. He told me Meyers "is a great guy, a truly great guy" -- a guy who was the first person in the business to send a text congratulating Corden when he won the CBS gig in 2014. The two hosts first met several years ago at a dinner party and bonded over a completely unexpected connection. They both root for the British Premiere League soccer squad from West Ham. (James grew up there; Seth happened to randomly turn up for a game there in 1999.) For that and other reasons -- including the work duties they share with only a select circle -- they text each other somewhat regularly. "There really is no real rivalry," Corden's executive producer, Ben Winston, said. "Because we do such different shows." The late-night love-in has become pervasive among the shows -- on the broadcast networks anyway. Stephen Colbert and Jimmy Fallon both dropped by on each other's premieres. Colbert and Jimmy Kimmel even share an agent. Relations truly seem good among the entire gang of five. That's not how it used to be: Leno dueled with Letterman. Conan battled Leno. Kimmel taunted Leno. It made for headlines -- and schadenfreude-ic fun. But most of those hostilities centered on the Iron Throne: the "Tonight" show. "We all have the shows we want now," Meyers said. "It's not like we are all battling over that one piece of real estate." His executive producer, Mike Shoemaker, added: "Everyone's got their own little castle." So what to expect when Corden drops by "Late Night?" Something a bit spontaneous. Unlike the usual late-night practice, he's not doing a pre-interview. "Just two intelligent guys having a chat," was how Winston put it. And maybe a bit more. "James has something fun planned," he said. --Bill Carter is a contributor to CNN and CNNMedia.